Alyssa Carlier | The Devil Orders Takeout: Snazzy Snippets: Writers, let's get vulnerable + spin-off from Mulan + Swan Lake retelling! Snazzy Snippets: Writers, let's get vulnerable + spin-off from Mulan + Swan Lake retelling! SOOOOO. How did everyone do with Camp NaNoWriMo? Or other April-y writerly pursuits? 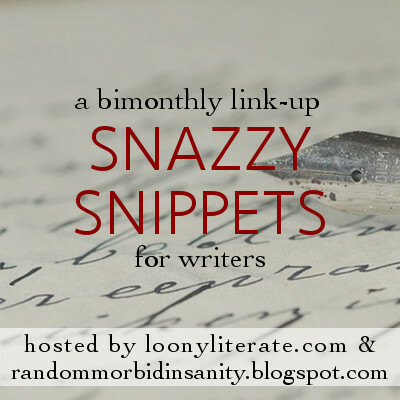 Snazzy Snippets is baaaack for writers to share their snippets! It’s an opportunity for writers! Every two months, we post a prompt or question for you to share a snippet of fewer than 500 words. It’s designed to let you have fun, analyse your work on a smaller level, or just write something to join in. Still have questions? Snazzy Snippets has its own page on the blog, with FAQs and more. Take a look! Reminder that this isn't just for novels! The prompts were designed with novels in mind, but most are also applicable to short stories, poetry, anything. I'm sharing a short story snippet myself this time! Remember to include your post URL in the linky! I'll be sure to visit ALL your snazzy snippets. Right now, the Huntress had idiots to kill. She pointed a finger at the chair she’d been tied to. Orange-red flames exploded around it, then she sent it flying into two of the soldiers. One, two. Then someone fired his rifle and knocked the breath out of the Huntress. The bullet turned the silver embroidery at her shoulder red. The Huntress smiled. The magic burned, yes, but so did she. Three four five were summarily tossed out the window. The last one, with a colonel’s rank bars, gripped his knives too tightly. He crouched between the Huntress and the Idiot, his lips pulled into a grim line. The Huntress half-turned away to sip at the tea again. The colonel rushed in, his knives flashing, and the Huntress smashed the teacup on his head. Waste of good porcelain, she thought mournfully as the tea swirled together with the blood. “I hate pu’er tea,” she growled. This snippet is from murder with teacups or just teacups, a short story starring the Huntress, a non-POV major character in the Mulan + Swan Lake retelling. The Huntress is a deaf assassin-witch who conquers cities and critiques tea. The entire short story came from the idea of a teacup as a murder weapon, and a snarky one-liner commenting on the tea afterwards. Yes, I wrote it after watching Spectre. teacups is pretty James-Bond-inspired as a whole, but more like fem!James Bond in China. Hey, they took him to space once, it's not that preposterous. Mo knelt by the body. Mo tugged off her white jade earrings, stained with a bit of blood that looked black in the light. Silver glinting at the throat. A locket, in the shape of a wing, rusted silver. Mo lifted the head to tug off the locket. 3. dying was not dead. 4. witch = danger and death [and so on]. Conclusion: Mo slipped her knife between the witch’s ribs. Her hands were shaking when she took the knife back out. Shaking too much, in fact, to continue tonight. She rearranged the witch-corpse and dragged her clasped hands to cover the wound. “Sorry,” she murmured, putting a hand over the clasped hands. She’d pray but what prayers could she say when no gods were listening anymore? A little context: recently an episode of the 100 aired. I don't watch the show, but as I understand it, a lesbian character died and the media began to reconsider the death of LGBT+ characters. Which is fabulous and necessary. But guess what this person did in the first chapter of her WIP. After talking with some fabulous people and reading soooooo many Tumblr posts about the issue, I rethought this scene. And rethought it again. I seriously considered setting this WIP aside for later. Another interesting point is that in the initial concept, Mo was five vicious feet of murder and mayhem. Somehow she became a girl who thinks all the vicious things and does none of them. So far, I'm liking this change. No, she didn’t faint. She just executed a strategic retreat with no backup plan. I actually like this snippet very much. We don't get inside the Huntress' head a lot in the WIP, but as we can see in the short story, it's a rather conflicted place. More details, sadly, would be spoilers. The actual thing that needs changing are the monsters. While they haven't changed that much from the original concept, I realise that they conform more closely in Chinese to the term 妖怪, which I feel demon is a more accurate translation of. It's sad to lose the monsters-and-magic alliteration, though.